What inspired us to open pubs in Kyoto, the cultural heart of Japan? The answer is simply a love for pubs. Man in the Moon was founded by a Kyoto native with a passion for travel, English conversation, and tasty beverages. "Mr. Moon" spent his life working in Japan's beer industry. When he wasn't working he was off to Europe with his lovely wife to see the sights and enjoy a pint at the local pub. He wished to bring this experience home to Kyoto for others to enjoy. In 2008 he did just that! ​It's hard to believe that it's already 2019 and we have opened four beautiful pubs in Kyoto and our flagship Tokyo pub in Shinbashi! We have cherished the wonderful memories created during this exciting journey. We hope that you will be in the good times and happy memories to come! Celebrating 11 Years in Kyoto! Kyoto man Yuichi Nakamura, founder of Irish pub chain Man in the Moon, celebrates 10 years in business and tells us about what inspired him to embark on this journey and 'the craic' along the way. When you first opened in 2008, did you imagine you would make it to 10 years and beyond? Not at all. 10 years ago there weren’t that many Irish pubs here so it was a risk. But it was also an untapped market. Our British pub Pig and Whistle had already been going strong for 20 years, so I knew there was a market for this kind of bar; a place with lots of good beer, decent pub grub, sports on tv, and a friendly atmosphere where tourists and locals can mix and relax together. The Irish Pub brand is renowned over the world so I figured it was a good opportunity to branch into this market too. And since then the Irish pub business has grown enormously in Kyoto. We have since opened 3 more Man in the Moon pubs in Kyoto and also one in Tokyo. I believe there are up to about 10 Irish pubs in the city now. Have you ever pulled a pint of Guinness? I have, but I'm better at drinking it! I pulled a pint at the Guinness Factory in Dublin 10 years ago, while researching about Irish pubs before starting Man in the Moon. It was a great experience, the real McCoy! And it was fun to go pub-hopping in Temple bar, Dublin – the central pub area in Dublin city centre. What's your own drink of choice? Mmm it depends on my mood and what I'm doing. Beer is probably my usual for a casual drink. I like to try lots of beers. Sapporo is a staple. But this summer we brought in Pilsner Urquell from Czech on tap for the first time so I've been enjoying that. I also like Guinness in Autumn and Winter. With food I prefer champagne and wine. If you were to really push me for a favorite, I would say Corton-Charlemagne, a very good Burgundy white wine. But we don’t have that in the pubs haha! So you have both British and Irish pubs. What would you say is the difference? It’s about many things. For instance the interior of British pubs is often dark red and with carpet, while the Irish style on the other hand is often wooden floors and is more colorful. Man in the Moon is blue, red and yellow; very colorful, while our British pub Pig and Whistle has dark red as its main base color. 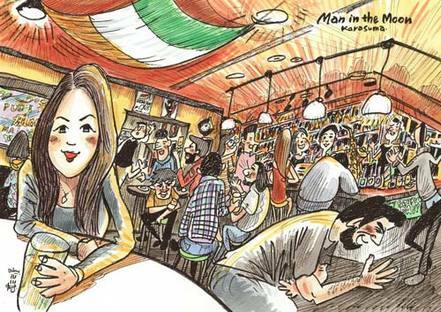 Also the atmosphere; it's more casual in Irish bars and can get pretty lively with music and dancing. In Kyoto station, if someone feels like dancing, they often get up and dance, other people will join in and it's really fun. I believe they call it 'the craic' in Ireland. I feel that the British style, while casual, fun and friendly, is a bit more reserved. There are of course things that overlap, for instance Guinness and fish and chips are popular in both. I think its fair to say they that they are 2 sides of the same coin. Where did you get the name 'Man in the Moon'? I remember the first time I saw the picture of a moon face drinking a beer, which is now our logo. I saw it in a book about Irish pub names and it stood out to me as interesting picture. It also quoted a line from Shakespeare’s A Midsummer Nights Dream, which I read and enjoyed, as a high school student. The line was 'All I wanted to tell you is that the lantern is the moon, I’m the man in the moon.' So it struck a chord with me. What do you think is the reason behind Kyoto Station's success and longevity? Firstly we are extremely luck to have an excellent location on the south west side of Kyoto station where people are constantly passing through. Secondly the hard work of our staff. They work hard no matter how tired they are and they always welcome our customers warmly with 'irashaimase'. We always try to get to know our customers and as such most of our staff can speak little bits of many languages. Hospitality is at the core of our business. I leave it to our staff to work their magic. And thirdly our fantastic customers: regulars and tourists alike. 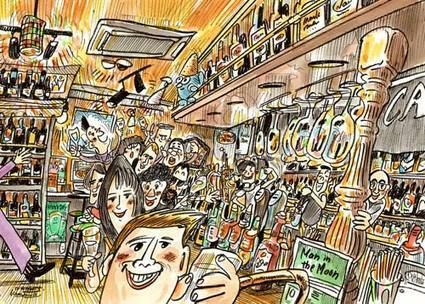 We have a great base of regular customers and they are the foundation of the pub. Tourists come for a while and hang out with us while they are in town and make great memories. One of our regular customers, Hiramatsu-san comes every weekend. He sits at the counter and drinks Guinness from his own special Guinness mug. He is a Japanese man, but speaks a little bit of many languages such as English, French, German, the list goes on. So he is able to chat with almost anyone who comes into the pub. And he does. These are the customers that we owe our success to.